That’s Kim Perez (on the left). She was born on the same day that Neil Armstrong and Buzz Aldrin walked on the moon. Happy Birthday, Kim! 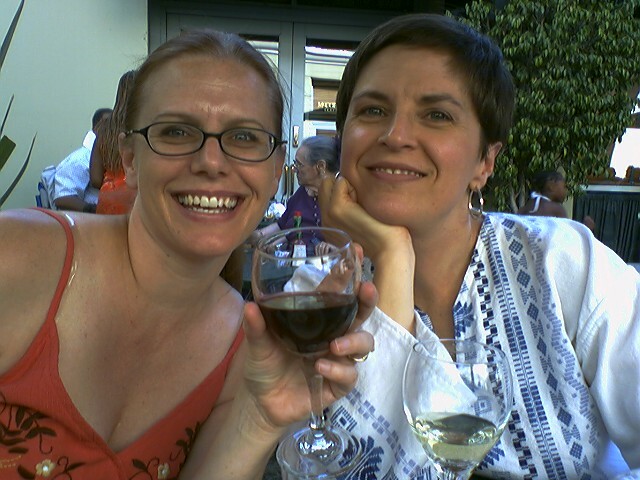 Lilli (on the right) and I raised a happy glass to Kim this past Wednesday at McCormick and Schmick’s, which has the best happy hour in Pasadena. Lots of great food options for cheap. Am I *the* KP??? Well, even if I’m not, I’ll make a list. Lists are fun. I realize I’m breaking the rules, since I’m not a blogger. Hope it’s okay if I just put my list here. I guess that makes me a blog squatter. 1. I eat two blueberry Eggo waffles every night around midnight. 2. My family auditioned for “Family Feud” when I was 12. Our team consisted of my mom, my aunt, two cousins and me. We didn’t make it. 3. On a camping trip when I was a kid, my friend and I were hitting a tree stump with some sticks. Apparently we angered a hive of wasps. Just like in the cartoons, dozens of them appeared as if from nowhere and, moving as one cohesive unit, chased us for several minutes and stung us all over our bodies. I was grounded from tree stumps for the rest of the weekend. 4. To play off one of yours, Kelly… I’m a living testament to the argument for nature over nurture (which you’ve probably figured out by now). 5. I have an unusually long attention span. I once found a book sitting beside a dumpster, waiting to be thrown out. I rescued it, took it home around noon, read straight through til about 2 a.m. and finished the book. This is psycho! 6. As my parents used to say, I’m “an accident waiting to happen.” When I was younger and more active I dislocated both knees; barely missed doing serious neck damage taking an alternate route down the mountain on a sled – head first off a 10-foot drop; and I once sunk in quicksand up to my chest, and it took 3 guys to help me get out. These are just the highlights of a very long list. 7. I’m lazy about getting the little details done and I hate running errands. So if Carlos doesn’t go to the grocery store, we’ll go without food. 8. I correct people’s grammar. To my constant surprise, they don’t usually appreciate it. This entry was posted on 20 July, 2007 at 10:00 am and is filed under Around Town, Food & Drink, Let's Get Visual. You can follow any responses to this entry through the RSS 2.0 feed. You can leave a response, or trackback from your own site. I always correct people’s grammar. They usually feel insulted. P.S. That was me who called you around 9:30 your time last night and didn’t leave a message. Thank you for the birthday wishes, Kelly! Had such a wonderful day. Hiked around Topanga State Park in the afternoon, then saw Noel Coward’s “Blithe Spirit” at The Will Greer Theatricum Botanicum in the evening. Thanks for the suggestion! I highly recommend the Happy Hour Crab Cakes @ McC & Schm.